A study carried out this year found that 69 percent of consumers plan to purchase gifts on marketplaces this holiday season. So, what does this mean for online sellers? From now until January, they will be faced with one of the busiest times of the year. We have identified key data-driven insights to help you improve customer service by preparing your customer support team for what’s ahead. How much of a rise in volume should you expect for the most common queries? When to expect the highest volume of queries? How many support tickets are you likely to have for every sale? Product queries take pole position as the most common query, followed by order, shipping, cancellation, returns and negative feedback. According to xSellco customer support data, the bulk of an online seller’s support tickets are product queries – taking up 26 percent of your support team’s activities for most of the year. Product queries can include questions such as, “How do I use my product,”or “The product I ordered is different to the store description.” With product queries, you can anticipate most of your customer needs in advance. You can speed up your response times by predicting common issues that your customer might face when they receive their product. Send customers detailed product information and user guides in your follow-up thank you message. Improve the customer experience of your store by getting into the habit of going the extra mile for your customer all year round. Equip your customer with all the resources they need to enjoy their purchase. Make the shopping experience easy for your customer. Display product information clearly on your webstore and on marketplace listings to reduce the frequency of customer contact for common queries. Give your customer the independence to self serve by providing them with answers to simple questions before they feel the need to escalate their query to your support team. You can include FAQs in your product listings, or add a knowledge base to your online store that includes product user guides and how-to videos. As you might expect, shoppers get anxious about delivery dates during the holiday season. Luckily, there are simple ways to prepare for the abundance of incoming queries. Prepare some messages in advance so that you can respond faster to the questions you know will arise. Timing tip: Expect the peak times for shipping queries around Dec. 20, when customers are worried that their parcels won’t arrive in time for Christmas. Order queries rise by over 74 percent during the holiday period. Tell your customer when their order has been dispatched using automated message software. If you are selling on Amazon, you will need to send Amazon a dispatch notice one to two days after the order has been placed. Failure to alert Amazon of the dispatch will affect your “late shipment rate” and “perfect order percentage” metrics. On any sales channel, whether it is your Shopify, Magento or BigCommerce store, a sale on social media, or a marketplace order on Amazon, eBay or Allegro, never leave your customer waiting for a dispatch notice after they have placed an order. Knowledge removes anxiety and will reduce any queries related to uncertain fulfillment. If delays are likely, inform the customer how long the process will take within the order confirmation message. The most concerning result that the xSellco analytics team discovered was the rise in negative feedback. In 2016, sellers received an average increase of 68 per cent in negative feedback from customers during the holiday season. The data highlights the need to anticipate customer needs and prepare in advance for the seasonal surge of customer support requests. Let’s learn from last year’s mistakes and eliminate any possibility of damaging your brand reputation and lowering your seller score. Personalize your response, using the customer name and your own name – this will help your customer identify with you and your brand. Default to a positive tone. This suggests that the customer can expect a happy resolution to their problem. Remember to apologize and show your customer that you value their feedback. Combat any potential rise in negative reviews, by asking for feedback from shoppers who had a flawless experience. Avoid using negative language in your response. Don’t let all your hard work for the past year go to waste by getting carried away with the holiday hustle. After all, your seller ratings are for the whole year. The peak day for customer support is Dec. 12. Time will be limited for getting orders shipped in time for Christmas after the busiest day for customer support, so make sure your team has a fluid communication flow with your vendors for inventory and fulfillment. Remember to include tracking on every order, where cost effective. For Amazon sellers, tracked orders are essential to boosting your performance metrics. 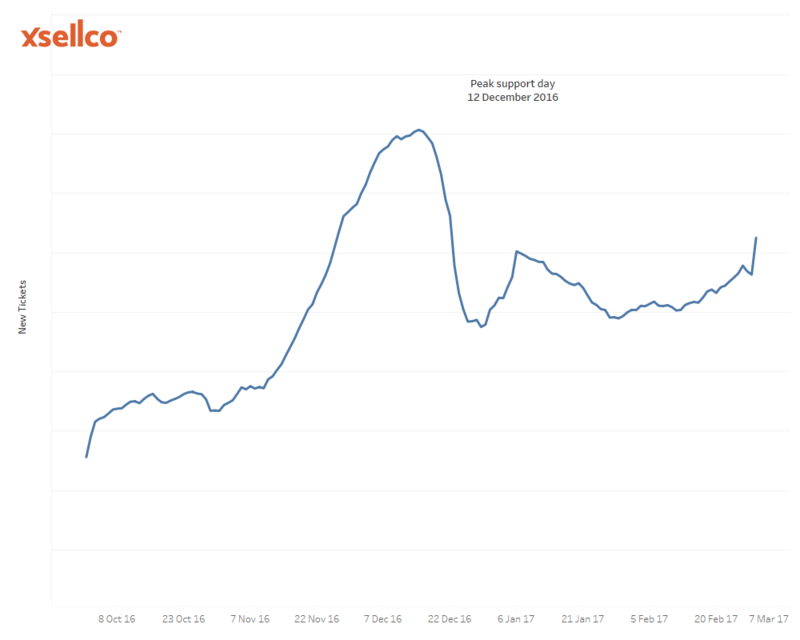 The xSellco analysts discovered that on the busiest week of the year in 2016, leading up to Christmas, sellers had one support ticket for every five sales that they made. 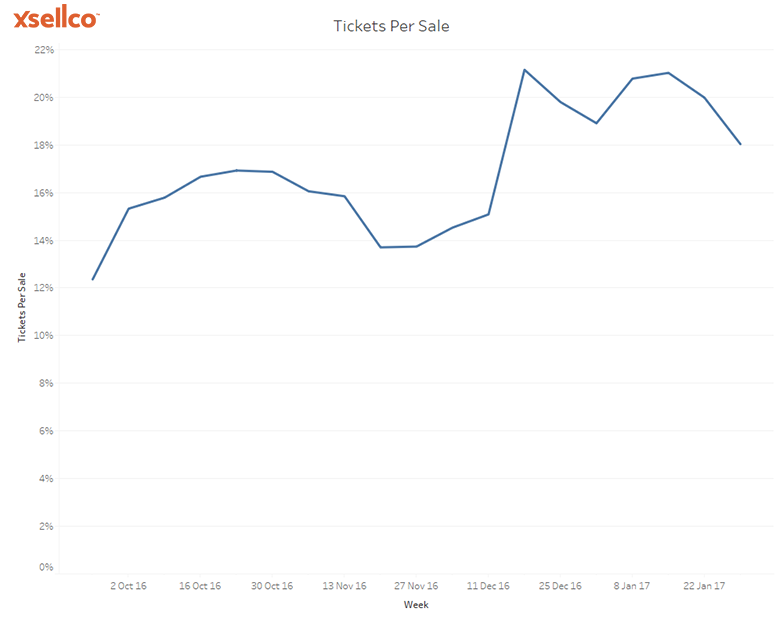 You will see from the graph below that this has increased from the normal day of one support ticket for every eight sales to one in five. Be aware that the volume slowly decreases to one ticket in seven sales throughout January. With this information you can calculate how many support requests you might receive over the holidays based on how many sales you make. Pro Tip: Make sure that your message reaches its destination. When sending attachments in your responses, be aware that eBay will only take image files, whereas Amazon will send pdfs and most file types. If using xSellco Helpdesk, you can ensure that your message gets there in one piece by tailoring the conditions to your template responses for each individual sales channels. Armed with the right information in advance, you can improve your customer service all year round with a data-driven approach. Think long-term and win your customers’ hearts over with great customer service that keeps them coming back for more. When you create a positive experience, people will get behind your brand so take steps this holiday season to inspire them and make them happy. By automating responses to common queries, you will free up your time to focus on creating a fully rounded welcome package for the holiday customer.